NEW YORK—February 23, 2010—Aviant Systems, Inc., a leading RFID systems integrator, introduced an open-standard wireless solution with RecycleBank® today. Recycling collection trucks in Burlington, NJ will be the first to use the on-board RFID system, which automatically records and transmits customer pick-up information over a cellular network connection. Aviant built the on-board solution to collect data using RFID at each pick-up location and to transmit the information to a data processing center at regular intervals throughout the day. It is now possible to know the exact day and time a customer’s recycling was collected. Trucks can also be located at any time using their GPS coordinates. Each on-board system incorporates a Low Frequency (LF) reader and antenna from Texas Instruments and an Ultra High Frequency (UHF) reader and antenna from Feig. Data is transmitted using GPRS over the T-Mobile network. The solution also utilizes the Web-based Wyless Management Platform, Porthos, to provide visibility and control over GPRS connectivity at any time. When one of the Burlington trucks is started, the on-board wireless solution powers up. An automated arm on the truck lifts and empties recycling containers. The arm is equipped with a sensor that detects movement, which activates the RFID reader to read the tag on the container and record the data to the on-board database. This includes the truck, date, time, RFID number and GPS coordinates of the pick-up location. The information is then sent to a data processing center. If an error occurs with the on-board solution, Aviant can send a new application and/or initialization file directly to the remote unit. If the system needs to be rebooted, the driver can simply turn the truck off and restart it. There is no keyboard, mouse or monitor on-board that could complicate the diagnostic process. The solution is currently a non-weighing solution, but according to Bonnell, developments are under way to integrate weight scales with the system. Aviant also plans to add the ability to read bar code tags. Both capabilities are expected by the third quarter of 2010. RecycleBank® motivates people to recycle and rewards consumers for taking greener actions with points that can be redeemed from participating local and national business partners. For more information, visit www.RecycleBank.com. RecycleBank needed an RFID antenna that could withstand the harsh winters in the Midwest. Aviant designed and continues to produce a rugged, weatherproof antenna system that ensures customer usage data can be collected and transmitted at all times. A military contractor needed a solution to read tags with a handheld device. Aviant was commissioned to build a one of a kind handheld device complete with custom database table to perform an ID lookup in the field. This device ID’s all round types, is rugged enough to withstand the tough demands of the military, and exhibits a long battery life. A medical device manufacturer turned to Aviant for a solution to track disposable filters. The solution ensured that items with a lifespan (50 hours of operating time for example) were tracked to prevent overuse, reducing liability for the supplier. This solution was designed to improve revenue for the supplier by ensuring timely disposal of filters. Automotive companies have discovered the benefits of RFID. Automotive companies have discovered the benefits of RFID. Tool tracking through production operations is one area where Aviant has helped to bring these benefits to the auto sector. A major ski resort approached Aviant to develop a solution for access control. The team at Aviant built a prototype hardware and software solution and demonstrated it to the resort. 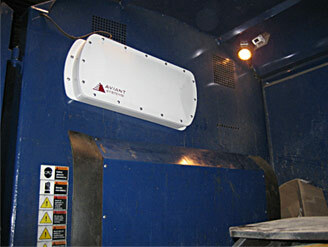 The solution met the needs of the test and demonstrated a new era in ski resort access control.